Yes, indeed. It was around 7:30 pm. A summer night in 1965. Pretty sure it was a Friday, because my Poppa bought me new books on Thursdays, and it was his latest gift at fault. In response to my outrage over the ending, my mother lent me her typewriter and suggested I fix it. That was that. I had the power. That depends who’s reading it. Some are very critical, but I’m a willing reader—I’ll put up with clunky prose if what’s being told catches my imagination. I’ll even overlook a few gaffs if I care about the characters. On the other hand, what tosses me out of a story? Characters I can’t believe. Next would come violence for shock value, not plot. What’s most important to me, in the end, is how a story stays with me—that I’m better/happier/more satisfied/wildly engaged/thoughtful/exhausted for having read it. Search Image in particular? That the All Species Library of Linguistics and Culture is the coolest, most wonderful place in the universe. Also, that Esen’s back for good. In general, after reading my books? For readers to close the cover and want to linger in the feeling they have, but also to have their imaginations take flight. I’d ask for nothing more. Andre Norton’s STAR RANGERS, reissued as THE LAST PLANET. It was the first SF I ever read, and stands even today as a favourite. She gave me a galaxy-spanning civilization made up of multiple species, at the verge of collapse, yet with so much hope in it. And wonder. I was hooked. Having sent out my first book, Josepha Sherman told me to write another. Not to wait for a result, but to keep writing. It kept me busy and happy. Also, because of that advice, I had Beholder’s Eye, introducing Esen, the main character in Search Image, well underway when Sheila Gilbert from DAW Books bought my first novel, A Thousand Words for Stranger. She bought it two months before Thousand was released. Looking back, that was the moment my career as a fiction author began. Meanwhile I’m looking forward to readers’ response to The Clan Chronicles: Tales from Plexis. This anthology is more a novel with multiple authors, featuring Sira and Morgan at an earlier time. The stories provide wonderful background to familiar characters and introduce new ones. It’s something. Out in December. Mac, meet Esen. Or Esen meet Mac. Depending on the circumstances, it could go very well, or not. Mac is Dr. Mackenzie Connor, the salmon researcher from Species Imperative who reluctantly begins to interact with aliens. Esen being the sum of all possible aliens, they could have either a great conversation or Mac would want to see them all. In order. With tests. What part of Esen and Paul did you enjoy writing the most? Their friendship. I wrote the ending of Beholder’s Eye a long long time before I wrote the rest of the book, and it still captures that feeling for me. These two beings come together as friends, and that’s going to shape their lives forever. Be brave. Trust that what you like in the silence of your head, or privacy of your room, is the good stuff. When you reread something you’ve written and love it, believe that feeling. You’re the ultimate judge. Those special passages are your voice, coming through. One of my tree frogs got out of its tank. I went in the kitchen to ask my parents if they’d seen him, only to spot him on the wall above my Mom. Before I could say anything, he dropped into the yolk of the egg on her plate. She didn’t so much as blink. With a little smile, she handed me the plate, and frog, and suggested I give him a bath. Life. Humanity. Working towards a future where we’ve a healthy world, full of wild diversity and free of strife. When? Now. Where? Here. Why? Because I’ve a life I love, work, friends, and family. Should I be curious about other times and locations? I have the power. All I need do is write my own story. The first book in the Web Shifter's Library series returns to the adventures of Esen, a shapeshifting alien and member of an ancient yet endangered race, who must navigate the perils of a hostile universe. Esen's back! And the dear little blob is in trouble again. Things began so well. She and her Human friend Paul Ragem have opened the doors to their greatest accomplishment, the All Species' Library of Linguistics and Culture. They're prepared for clients to arrive, but trouble comes knocking instead. First is Paul's family, who'd mourned his supposed death years ago. Understandably, feelings are bent. But what matters? Paul's father has gone missing. Before he can convince Esen to help him search, a friend shows up to use the Library. A crisis in the Dokeci System is about to explode into violence. To have a hope of stopping it, Evan Gooseberry needs answers. Unfortunately, the artifact he brought in trade holds its own distracting secret. A touch of very familiar blue. Lesy's "signature," left on all her creations. Web-flesh. The race is on. Paul, to find his father. Esen, to search for the rest of her Web-sister while helping Evan stop a war. What none of them realize is the price of success will be the most terrible choice of all. Thank you JULIE E. CZERNEDA for making this giveaway possible. 1 Winner will receive a Copy of Search Image by Julie E. Czerneda. "What is the last image you search on the web?" Hmm. It would have been hours or days ago, so I'm not quite sure. I did look up some renaissance "dance of death" frescoes after I read "The Museum Of Lost Art." wooden kids' toys. I was looking for ideas on what to make for gifts. Thanks! I loved the questions. 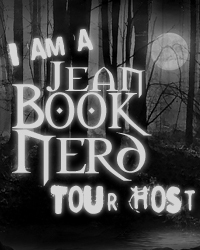 This was an enjoyable and appealing interview, so TYVM, Jean Book Nerd. Search Image is one of my most eagerly anticipated novels, no qualifiers needed! Esen has been since Beholder's Eye the character I've probably picked most often when asked, "What fictional character would you most like to meet?" The thought of Esen and *Mac* meeting is intriguing, and I also wish I could visit Esen and Paul's All Species Library of Linguistics and Culture.